When planning your garden you may be wondering what you can grow that would be great for preserving for winter. Canning is one of the most popular ways for preserving food at home. 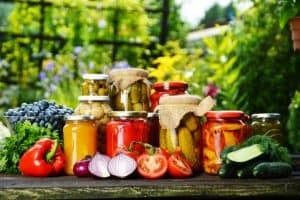 From fruit jellies and pie fillings to canned vegetables and pickles, your garden can host a world of amazing plants that can help fill your pantry with canned goods right from your very own garden by growing these awesome things. When it comes to growing food for canning you can’t go wrong with a nice big crop of tomatoes. Pick a hardy heirloom variety that grows well in your area. Be sure to set up a great watering system and add lots of compost which will allow the tomatoes to grow to their full potential. Use tomatoes to can your own pasta sauce, salsa, or dice for winter chili. If your family enjoys home canned green beans they make a great addition to your canning garden. In addition to feeding your family, all winter long green beans add nitrogen to the soil helping your entire garden flourish this year and for the years to come. Open a can to serve with meat and potatoes when winter comes. Right along side your green beans you can grow sweet peas. Tender sweet peas make a great addition to winter dinners and are easy for even the most inexperienced home canners. 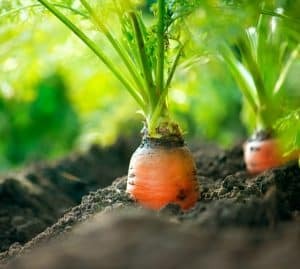 At the end of the season till the stalks into your garden beds to add organic matter to your soil for next years garden. For most families, pickles are a favorite fermented food. Fermented foods are great for your gut health. Cucumbers are easy to grow in your canning garden and are perfect for pickling to treat your family to fresh pickles all winter long. Early crops are perfect for picking or the last few cookouts of the year. Grow cucumbers near your zucchini and melons. If you have space along fence lines that are hit by full sun corn is a great option to grow. While you won’t get a huge crop from growing your own corn you will get plenty for home canning as well as providing support for your vining crops like green beans without having to waste space with adding a trellis. Can your corn with some peppers to give it a bit of a kick. Green beans are not the only ones that are great for your soil. Growing beans for winter chilis, red beans and rice, refried beans or black bean soup is a great way to turn your canning garden into a protein powerhouse. There are a huge variety of beans that you can grow if you have the space. Beans are also a great thing to grow for canning. Grow beans in beds that could use a boost of nitrogen for the next year and rotate every year to provide your family with a great source of protein and keep your garden soil healthy and flourishing. Peppers are another amazing staple for canning gardens. From adding flavor to egg dishes to making vegetables taste better than ever and encouraging picky eaters to eat vegetables with fresh homemade salsa. Growing peppers near your tomatoes can give the tomatoes more flavor. Choose a spicy variety for homemade jalapeno jelly or cowboy candy. Add diced tomatoes for your favorite chili recipe. Caggage is a great leafy vegetable to grow in your canning garden. Fermenting into sauerkraut and canning for a long shelf life is the perfect way to add healthy fermented foods to your families diet all winter long. This plant grows large getting you a lot of food for the amount of time that goes into growing it. Strawberries are by far not the only berry option out there. 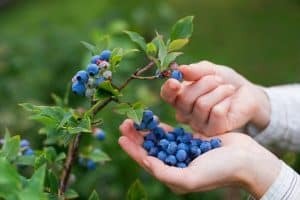 Planting blueberry bushes for canned blueberry pie filling or raspberries for jams and jelly is a great way to make use of fence lines. These shrubs provide your family with an abundance of berries. Plant berry bushes along fence lines to create living privacy fences that provide your family with fruit. When people think of home canning they often think of jams and jellies. These simple canning staples are easy to learn and perfect for serving with toast or freshly baked bread on a cold winter day. One jam that is always a favorite it strawberry. Homemade strawberry jam helps preserve the fresh summer taste to brighten any winter day. Strawberries are easy to grow in pots or allow to take over their own garden bed as plants spread when they come back year after year. While many of us don’t live where we can grow citrus fruits in our gardens you can grow rhubarb with its tangy flavor. Rhubarb is a great replacement in pies for lemon and other citrus fruits. While not the same flavor it does make a perfect addition to a long cold winter. The large leafy plants are perfect for adding to your landscaping and will pop back up every year. Carrots are great for canning. They don’t have to be perfect to taste good. Even picky eaters that don’t like cooked carrots will notice if you use home canned carrots in your soups and stews all winter long. Start with a fresh garden bed and fill it with loose compost. You don’t want any rocks or hard sticks that could lead to crooked carrots but if they are crooked canning is a great way to hide the fact. Root vegetables like potatoes both regular and sweet are great for canning to feed your family over the winter. These can grow well in large containers that can be dumped for easy harvesting. Growing up rather than out you can get a large crop of potatoes for canning in the amount of space a stack of tires or a trash can takes up in your backyard. Canning a portion of your potato crop will keep them from going bad before you can use them. 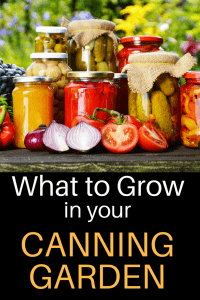 Did I miss any of your favorite crops to grow for canning? If so, let me know in the comments below. If you found this helpful, I’d love for you to “Pin It’!